Two-Bedroom plus Library Duplex with over 3000 sq. 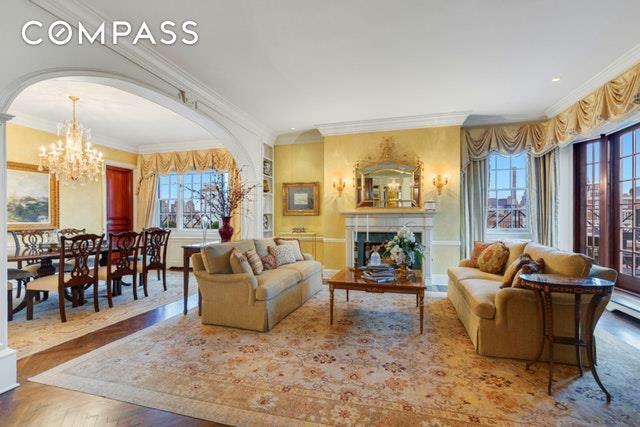 ft. of Private Outdoor Space Elegant and exceptionally rare, this 2-bedroom, 3-bathroom plus library home is situated on the top two floors in one of Park Avenues highly-coveted pre-war buildings. Wrapped with 3,000+ square feet of private outdoor space, easily accessible from every room, this enclave is an entertainer's delight. Occupying the full 16th and 17th floor with North, South, East and West exposures allows for abundant natural light to flood into the home.A private elevator landing provides access to the residence. 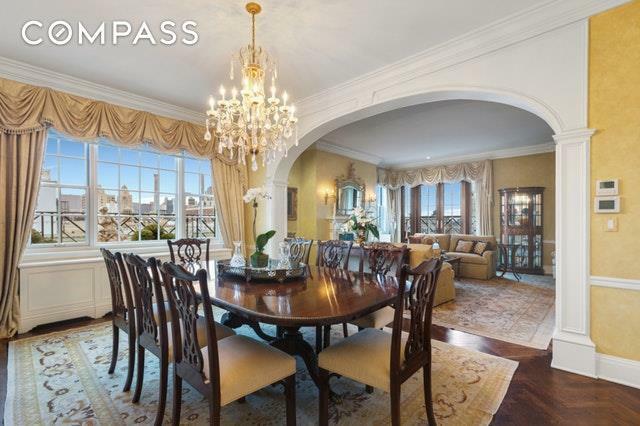 Be greeted by the spacious foyer with French doors that lead to one of three expansive terraces encompassing panoramic city views of Park Avenue, St. Ignatius Loyola church and beyond. The sun-drenched corner living room with wood-burning fireplace affords southwest exposures and opens into the generously proportioned South-facing formal dining room, easily seating 12.Adjoining the dining room is the windowed Chefs kitchen, outfitted with a double sink, two ovens and top-of-the line appliances: Miele dishwasher, a Subzero refrigerator, Thermador range hood and a Dynasty 4-burner stove with grill. 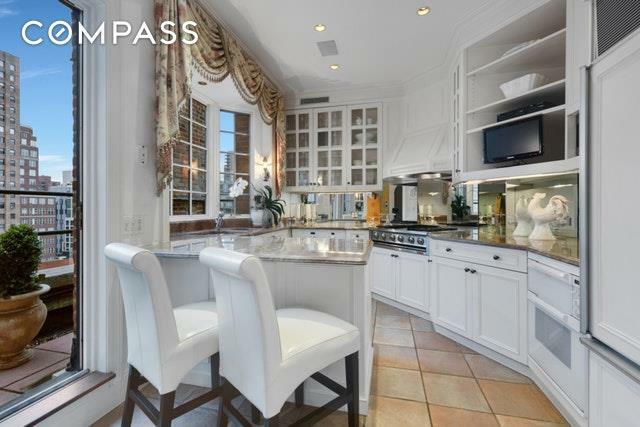 A separate laundry room, with Bosch washer and dryer, completes this space.Situated on the north side of the penthouse is a beautiful windowed guest bath and wooden paneled library/den with access to the widest part of the terrace boasting west and east exposures and multiple seating areas. A separate gracious guest bedroom with bath en-suite (featuring Samuel Heath bronze fixtures and a Lacava sink) completes this floor. Ascend the elegant staircase to the full-floor master suite graced with East and West exposures affording unparalleled light and city views. An en-suite bath replete with marble and Samuel Heath bronze fixtures and two expansive, lushly-planted terraces enhance this floor.Adorned in coveted pre-war details, ample closets, hardwood floors, and 3000+ square feet of private outdoor space, this elegantly designed penthouse is the ultimate retreat to enjoy outdoors this summer from the solitude of your own home.The premier 15-story boutique cooperative was builtin 1929. It was designed by renowned architect Pleasants Pennington and Albert W. Lewis for the T.E. Rhoades Company.Residents enjoy white-glove service, full-time doorman, staff deliveries right to apartment and a taxi call button in the elevator. A storage room conveys with the apartment. 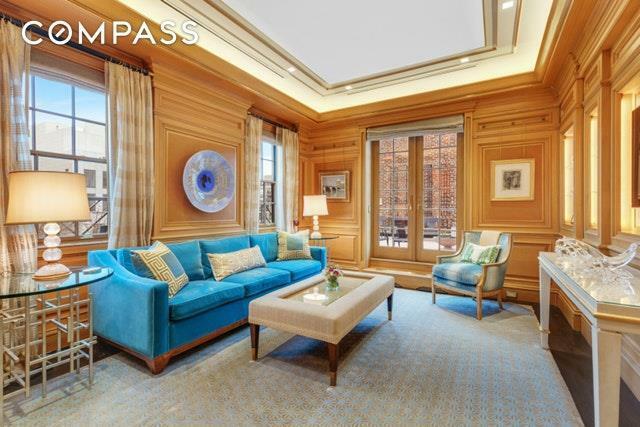 This pet-friendly building is conveniently located in the heart of the Upper East Side and is in close proximity to Central Park, the Museum Mile, fine dining, boutique shops and all public transportation.There is a $2,467.63 quarterly assessment through Q4 of 2021 for various building repairs and adjustments. 2% flip tax paid by buyer.